Six black ribbons in the flag? The historical flag of Jujuy was originally known as "Bandera Nacional de nuestra Libertad Civil" (National Flag of our Civil Liberties) and it could be the oldest Argentine flag preserved. There are other Argentine flags in museums that may be older but their age has not absolutely been confirmed. At the end of 1812 and the beginnins of 1813 the Northern Army commanded by General Manuel Belgrano defeated the Spanish royalist army in the Battles of Las Piedras, Tucumán and Salta. On May 25th 1813, the third anniversary of the May Revolution was celebrated. May 25th, 1810 had been the beginning of Argentine struggle for autonomy and leading later towards total independence. There was a custom in those days for holidays or patriotic events, parading the royal standard through the city and among the people. The standard was of a red field with the Arms of the Spanish King on its center. General Manuel Belgrano thought that as the patriots were fighting against Ferdinand VII troops, the parade of the royal standard should not longer be made. To replace the standard Belgrano gave as a gift on May 25 of 1813 a new symbol to the City of Jujuy.It was referred in that times as "bandera" (flag) but it could have been a standard as it was meant to replace the royal standard. The texts refer to it as "Bandera Nacional de nuestra Libertad Civil" (National Flag of our Civil Liberties). As said before, this flag was originally intended as a replacement of the royalist standard and it was not as a regional symbol. The design of this flag was a plain white field with the seal of the General Assembly, in session in Buenos Aires, painted at the center. In time, the seal of the Assembly would become the Argentine coat of arms. The Phrygian cap in the coat of arms has an interesting design that looks more as a mascapaicha than as a European Phrygian cap. The mascapaicha was the ancient Inca royal red cap made of wool with a tassel of gold. It was an equivalent to a royal crown, worn by Inca emperors. In South America, during the first years of struggle for authonomy and independence, the ancient Inca Empire was seen as a kind of inspiration force. And some people even wanted to create a Monarchy with a king of Inca ancestry. The flag was raised in patriotic celebrations and parades. But it had to be evacuated from the City of Jujuy in 1814, before the city and surrounding areas would be re-conquered by the Spanish Royalist Army. 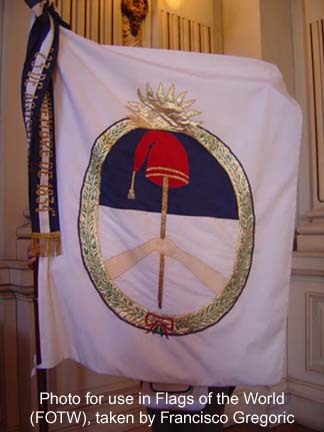 In that moment and during the royalist occupation of Jujuy, the flag was kept in Tucumán. When Jujuy was re-taken and finally sure, the flag returned to the city of Jujuy in 1815. The flag has always been preserved as a holy patriotic (relic) symbol since there. But apparently it has been restored several times. It is possible that the red ribbon tiding the laurel branches of the Coat of Arms may have been changed during the federalist period of the 1830s or 1840s. The ribbon originally may have been sky blue. 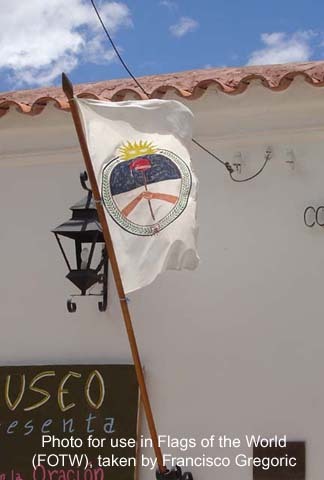 The flag has been preserved in several different places of the City of Jujuy, for example the Cabildo (old City Hall), a church, the Provincial Legislature, and the office of the governor of the province. Since 1920 the flag could not be taking outside the City of Jujuy, in accordance to regulations by a provincial law. ARTICULO 1º.- Adóptase a la "Bandera Nacional de Nuestra Libertad Civil", así denominada por el Cabildo de la ciudad de San Salvador de Jujuy en el acta respectiva del 25 de mayo de 1813 y que fuera entregada a éste y a su pueblo por el General Doctor Don Manuel Belgrano, como "Bandera de la Provincia de Jujuy". a) Los ideales de autonomía de Jujuy como parte indivisible de la República Argentina constituída en Estado Federal. b) El valor del pueblo jujeño en la defensa de la Patria durante la guerra de la Independencia y su afectuoso reconocimiento por el Comandante del Ejército del Norte y creador de la Bandera Nacional, el General Don Manuel Belgrano. c) El espíritu de libertad y federalismo que animó a la Provincia desde los primeros años de la emancipación. d) Los duros sacrificios y los logros de su pueblo a través de la historia. e) La vigencia de las instituciones provinciales, afianzadas en la Constitución como símbolo de la participación democrática. f) La caracterización de los objetivos definidos en el Preámbulo de la Constitución Provincial como proyecto social. g) La vocación de unidad y de amor al terruño de todos los hijos de Jujuy, cualquiera sea el lugar en que se hallaren. ARTICULO 3º.- La Bandera Provincial se representará con un paño de color blanco que reproduzca exactamente al escudo que tiene pintado el pabellón donado por el General Don Manuel Belgrano. No se admiten inscripciones en el paño ni flecos agregados a los contornos. Su largo tendrá la proporción 3 a 2 o bien 1 a 1 respecto de su ancho. ARTICULO 4º.- La Bandera Provincial no será materialmente mayor que la Bandera Nacional que se use en forma conjunta, ubicándose en posición inmediata inferior a ésta, o en paralelo a su izquierda. En el ceremonial debe observarse precedencia en favor de la Bandera Nacional. ARTICULO 5º.- Tienen derecho a enarbolar la Bandera de la Provincia: las reparticiones y organismos dependientes del Gobierno Provincial y de los Gobiernos Municipales, las Delegaciones Culturales, Deportivas y de cualquier otro carácter que representen a la Provincia o a sus instituciones fuera de su territorio, las Asociaciones de Residentes Jujeños, las Fuerzas Vivas de la Provincia, las Fuerzas de Seguridad, las Fuerzas Armadas con asiento en la Provincia y los particulares. ARTICULO 6º.- La Bandera Provincial será enarbolada dentro del territorio de Jujuy en todos los actos de conmemoración histórica o patriótica. ARTICULO 7º.- La Bandera de la Provincia se izará en mástil propio en todo acto oficial en que se enarbole el pabellón Nacional dentro de la Provincia, salvo que razones de fuerza mayor determine que se coloquen ambas enseñas en un mismo mástil. ARTICULO 8º.- Cuando la Bandera Provincial se enarbole en asta de mano, se colocará junto a la lanza, una corbata con colores azul, celeste y blanco, tal como están dispuestos en la Bandera Nacional. En su extremo izquierdo, inscripto en la franja blanca se bordará en letras doradas la fecha "23 DE AGOSTO DE 1812" en recuerdo del Exodo, máxima gesta del pueblo jujeño. En el otro extremo de la corbata se bordará simétricamente y con iguales caracteres la fecha "18 DE NOVIEMBRE DE 1834" representando el momento en que se proclamó la autonomía de la Provincia. ARTICULO 9º.- El Poder Ejecutivo Provincial implementará los medios para la confección de un modelo de la Bandera sobre el que puedan copiarse todas sus reproducciones; también tomará las previsiones necesarias para la divulgación de esta Ley, especialmente en las escuelas, y para el enarbolamiento con la Bandera de todos los edificios y organismos públicos de la Provincia. Asimismo, deberá enarbolarse a la izquierda en los despachos de los titulares de los tres Poderes del Estado. ARTICULO 10º.- Comuníquese al Poder Ejecutivo Provincial, al Poder Judicial, a los Municipios de la Provincia, al Poder Ejecutivo Nacional, al Congreso de la Nación y a todas las Legislaturas y Poderes Ejecutivos de las restantes provincias argentinas y Capital Federal y remítase copia al doctor Miguel Carrillo Bascary. ARTICLE No. 1.- The "National Flag of our Civil Liberties", named like this by the City Council of of San Salvador de Jujuy during the ceremony of May 25th, 1813 when the flag was given to the City and to its people by General Doctor Manuel Belgrano, will be adopted as the "Flag of the Province of Jujuy." a) Jujuy ideals of autonomy as an indivisible part of the Argentine Republic constituted as a Federal State. b) The courage of the people from Jujuy defending the Motherland during the war of Independence, and the gratitude by the people of Jujuy to the Commander of the Northern Army and creator of the National Flag, General Manuel Belgrano. c) The spirit of freedom and federalism that encouraged the province since the first years of Emancipation. d) The hard sacrifices and achievements of Jujuy's People through history. e) The strength of the provincial institutions re-enforced in the Constitution as a symbol of democratic participation. f) The qualities of the objectives in the Preamble of the Provincial Constitutions as a social project. g) A calling to unity and love to the land by all the Children of Jujuy whatever place they are in. ARTICLE No. 3.- The Provincial Flag will be represented by a white cloth reproducing exactly the painted coat of arms found on the original flag donated by General Manuel Belgrano. No inscriptions on the flag or fringes are allowed. Its length will have the proportions of 3 to 2 or 1 to 1 in relation to its width. ARTICLE No. 4.- The Provincial Flag can not be larger than the National Flag when used together and it should be located in position immediately lower to the National Flag or parallel to its left. Proper protocol indicate that the place of honor must be always observed for the National Flag. ARTICLE No. 5.- The right to hoist the Flag of the Province is for the following: All branches and dependencies of the Provincial Government. Municipal Governments. Cultural and Athletic delegations as well as delegations of any other character representing the Province and its Institutions outside its territory. The Associations of residents of Jujuy, Civic Groups of the Province. The Security Forces, the Armed Forces with bases located in the Province and their citizens. ARTICLE No. 6.- The Provincial Flag will be hoisted inside the territory of Jujuy in all the historical and patriotic commemorative ceremonies. ARTICLE No. 7.- The Provincial Flag will be hoisted in its own flag pole in all official ceremonies when the National Flag is also hoisted within the Province, except when lacking an additional pole, both flags will hoisted in the same flag pole. ARTICLE No. 8.- When the Provincial Flag is carried by a standard-bearer a cravat it will be added with the colors sky blue and white, in the same way as they appear in the National Flag. On the extreme left of the cravat on the white stripe, a golden embroidered inscription will read the date "23 DE AGOSTO DE 1812" (23 August 1812) remembering the Exodus, the biggest heroic deed by the people of Jujuy. On the other side of the cravat will be embroidered symmetrically and with the same characters the date "18 DE NOVIEMBRE DE 1834" (18 November 1834) representing the moment when the Autonomy of the Province was announced. ARTICLE No. 9.- The Executive Power of the Province will implement all the means for the making of a flag model that will serve as the pattern to copy all the reproductions. The Executive Power will also take the necessary steps for the publication of this law specially among schools and for the hoisting of the flag in all the provincial public buildings. Furthermore in the offices of the heads of the three Powers of the State, the flag will be placed on the left side of the office. ARTICLE No. 10.- This law must be announced to the Provincial Executive Power, to the Judicial Power, to the Provincial Municipalities, to the National Executive Power, to the National Congress and to all the Legislatures and Executive Powers of all the Argentine Provinces including the Federal District, and a copy to Dr. Miguel Carrillo Bascary should be sent. HALL OF DELIBERATIONS, San Salvador de Jujuy, November 29, 1994. The first difference is that the Provincial Flag has two possible official ratios (1:1 and 3:2), which are not the ones of the original one. The piece of the original flag preserved is 1.65 m high × 1.46 m width. Another difference is that in the Provincial Flag the area where the laurel branches are located is usually made in a pale yellow color. The corbata (cravat, tie or ribbon) is a new feature not present in the original flag. Finally some indoors provincial flags have the coat of arms embroidered. In this case the full yellow areas are represented in a golden material or are embroidered with gold. The original flag was painted. It is important to add that the coat of arms in the historical and provincial flags is different from the Provincial Coat of Arms of Jujuy. A controversy exists about some Province of Jujuy flags that do have six black "moños" or ribbons. In some websites the flag appear with these ribbons, and last August, during the International Congress of Vexillology Vexilobaires 2005, I have been asked about this matter. When present, these ribbons appear at each side of the coat of arms (3 and 3). But there is nothing in the Law No.4816 text about any ribbons. 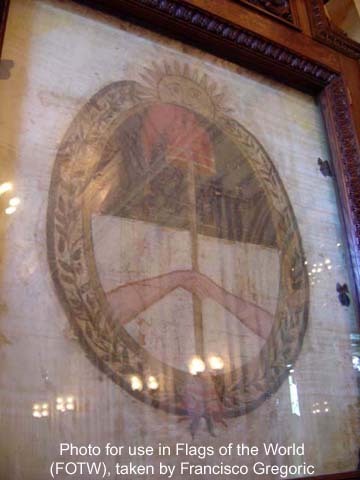 The original "National Flag of our Civil Liberties" is preserved in the Government Palace of Jujuy inside a glass wooden frame. The flag is attached to the frame by six small dark things (similar to laces) that appear to be ribbons. These "ribbons" are not part of the flag itself. Some years ago some people understood them as part of the flag and that is why they added them to several provincial flags. Even a meaning was given to the "ribbons". But these six dark ribbons are not part of the flag itself, and they should not be present in the provincial flag. photos taken by Francisco Gregoric with help of Carolina Morales and Misael Soria, January 2006. The 3:2 ratio flag is probably the one seen the most as provincial flag. However both, the 3:2 and the 1:1 ratio variants are official flags according to the flag law.